Tasty Tuesday – Slow Cooker Indian Chicken Stew | Who Are You Calling Crafty? I love my slow pot cooker (it is my BFF in the kitchen) we use it all the time because who has time to slave over a stove all day (not I said the mommy!) This recipe came from friends of our we made this yesterday and it was FANTASTIC! 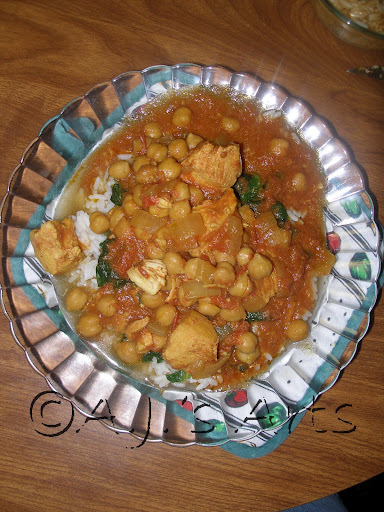 If you like Indian Food you will love this easy recipe! Lightly coat a 6-quart cooker with nonstick spray or oil. Add chicken, onion, and garlic to the slow cooker. Add curry powder, ginger, salt, and pepper to the slow cooker. Toss to coat. Stir in drained beans, undrained tomatoes, broth, and bay leaf. Cover and cook on high heat setting 4-5 hours or low heat setting 8-10 hours. Stir in lime juice into cooked stew. Stir spinach leaves into stew and let stand 2-3 minutes to wilt. Serve with rice. Makes 8 (about 1 1/2 cup) servings.